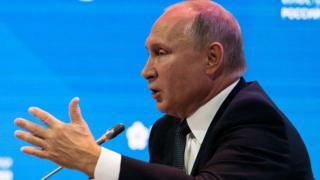 Russian President Vladimir Putin has labelled poisoned ex-Russian spy Sergei Skripal a “traitor” and a “scumbag”. In a speech he complained that the media were treating Mr Skripal as “some kind of human rights defender”, insisting he had betrayed his country. Mr Skripal and his daughter survived the Salisbury attack, which the UK says was carried out by two agents of Russian military intelligence. But a British woman died in another poisoning that police say was linked. UK authorities believe Mr Skripal’s door was targeted with the nerve agent Novichok. It was sprayed from a modified perfume bottle that was later picked up and given to Dawn Sturgess, who died in July, they say. Last month, President Putin insisted that the suspects named by UK police were civilians not criminals, and urged them to come forward. They later gave a televised interview. He said on Wednesday that he thought the whole “information campaign” surrounding the former Russian spy who defected to the UK had been “blown up” and that it would pass, “the sooner, the better”. Mr Skripal is a former Russian intelligence officer, who was arrested in 2004 and put on trial for “high treason in the form of espionage” by a Moscow military court. Authorities accused him of being a double-agent who shared Russian state secrets with Britain’s MI6. He confessed and co-operated at trial and was then jailed for 13 years, but was pardoned in 2010 then released as part of a prisoner exchange. “I see that some of our colleagues are pushing the theory that Mr Skripal was almost some kind of human rights activist,” Mr Putin said on Wednesday. The Russian leader, a former intelligence officer himself, then described Mr Skripal as a “traitor to the motherland”. The UK says two Russian nationals who travelled under the names of Alexander Petrov and Ruslan Boshirov tried to kill the ex-spy and his daughter Yulia. 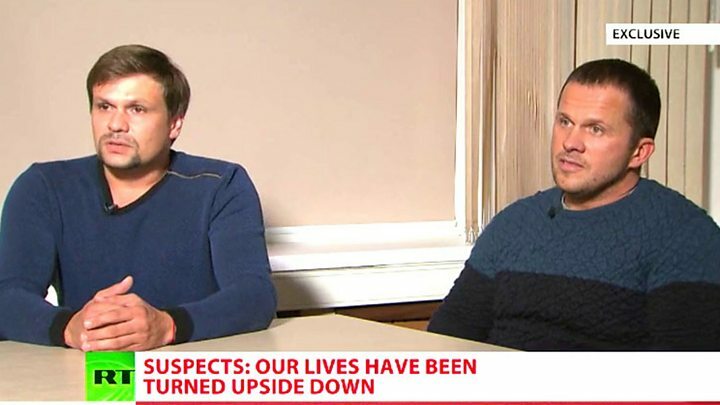 The two suspects gave a televised interview in Russia in which they claimed to be “just tourists” visiting the city of Salisbury because of their interest in its 123m (400ft) spire. However, their story was widely mocked in Russia as well as the UK, and one of the men was subsequently identified by an investigative website as Col Anatoliy Chepiga, an officer in Russia’s GRU military intelligence. The website, Bellingcat, said the colonel had been made “Hero of the Russian Federation” by President Putin himself in 2014. Speaking to the BBC, a woman in the town where Chepiga grew up then then identified the Salisbury suspect as the intelligence officer. On Wednesday Mr Putin dismissed the allegation that Russia was responsible for Ms Sturgess’s death. “Sometimes I’m amazed by what’s going on around this case: so some guys came to Great Britain and started poisoning homeless people? What nonsense!” he said.